Handsome Mega hero Varun Tej is currently busy shooting for Sreenu Vaitla’s Mister and Sekhar Kammula’s Fidaa, which are nearing completion. 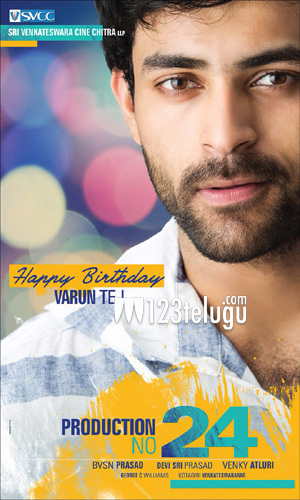 After these two projects, Varun will join hands with actor turned director Venky Atluri’s directorial debut. This film will be produced by senior producer BVSN Prasad on his Sri Venkateswara Cine Chitra banner. This will be his 24th production. The producer has roped in top technicians like Devi Sri Prasad and cinematographer George C Williams, who had cranked the camera for Tamil biggies such as Kaththi and Theri in the past. More details about the movie will be revealed soon.